In 1779, the Virginia legislature voted to move the capital from Williamsburg to Richmond. Until a permanent Capitol structure could be built, the General Assembly met in two wood-framed buildings at the corner of what is now 14th Street and Cary Street. These buildings were demolished before 1811, and a plaque now marks the site of these buildings. With the establishment of Richmond as the new capital, six squares of land were selected for the placement of permanent public buildings. The Capitol was designed by Thomas Jefferson, the third President of the United States. Jefferson modeled the Capitol after the Maison Carée, an ancient Roman temple in Nîmes, France, and secured the services of Charles-Louis Clérisseau, a well-known French authority of Classical buildings, as the Capitol's draftsman. 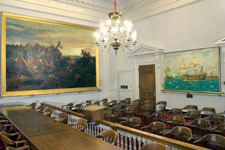 The General Assembly held its first Session in the Capitol in 1788. Jefferson's building is the middle structure of the present day Capitol complex. 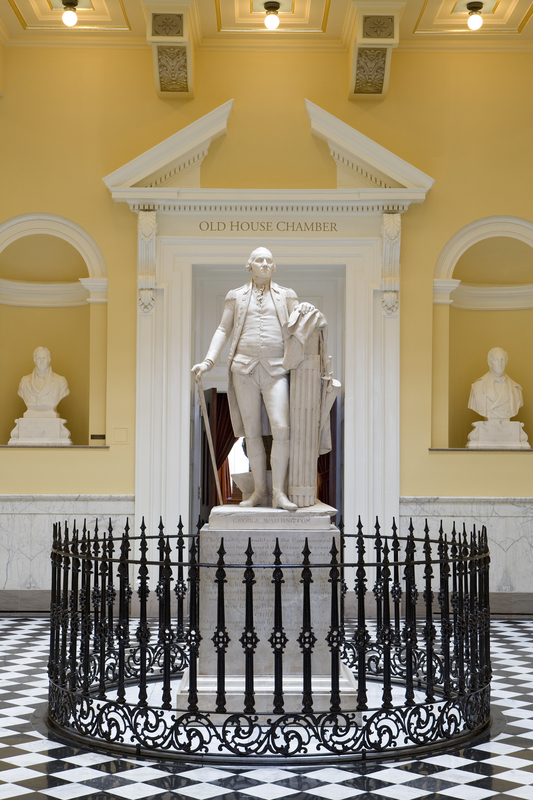 The Rotunda displays the life-size Houdon statue of George Washington and seven busts of Virginia-born presidents and the Marquis de Lafayette, the Frenchman who fought for America during the American Revolution. The Capitol building has witnessed two wars, a cholera outbreak, and the collapse of its third floor, known as the "Capitol Disaster." Despite all of this, the Capitol continues to represent a symbol of democracy. 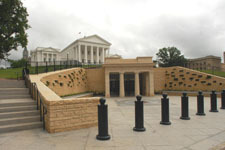 In 2004, the General Assembly embarked on a comprehensive three-year plan to restore both the exterior and interior of the Capitol. 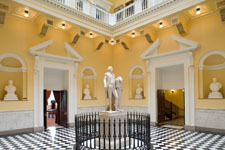 Virginia's historic Capitol has been fully restored to its early 20th-century appearance and the working space of the Capitol has been increased by about one-third by means of an underground extension. The Rotunda dome (30 feet in diameter) is located inside the Capitol directly under an exterior skylight on the A-line roof. The dome was added to the building by 1794 but Jefferson made no reference to a dome in his first written description for this central space, which he called the "conference room." Whether adding the dome was a later idea of Jefferson's or a modification made by Samuel Dobie, the actual builder of the Capitol, remains unknown. We do know Jefferson intended for a statue of Washington to be placed on this spot. In 1784, the General Assembly commissioned a marble bust of Lafayette and a marble statue of the Marquis de Lafayette, with the intent that the statuary would be placed in the new Capitol as symbols of public virtue from the Old and the New Worlds. These two statues were done from life by renowned French sculptor Jean-Antoine Houdon. Lafayette was voted a citizen of Virginia by an "act of assembly" in 1785 for his valuable services on behalf of the Commonwealth during the American Revolution. His bust was received from France in 1789 and Washington's statue was put into place in 1796. In 1930 the General Assembly authorized the placing of seven marble busts in the Rotunda as a Virginia "Hall of Presidents." All seven busts were installed on various dates in 1931, using private funds. Virginia is known as the "Mother of Presidents" with eight of her sons (including Washington) serving in that office. The busts depict Thomas Jefferson, James Madison, James Monroe, William Henry Harrison, John Tyler, Zachary Taylor and Woodrow Wilson. 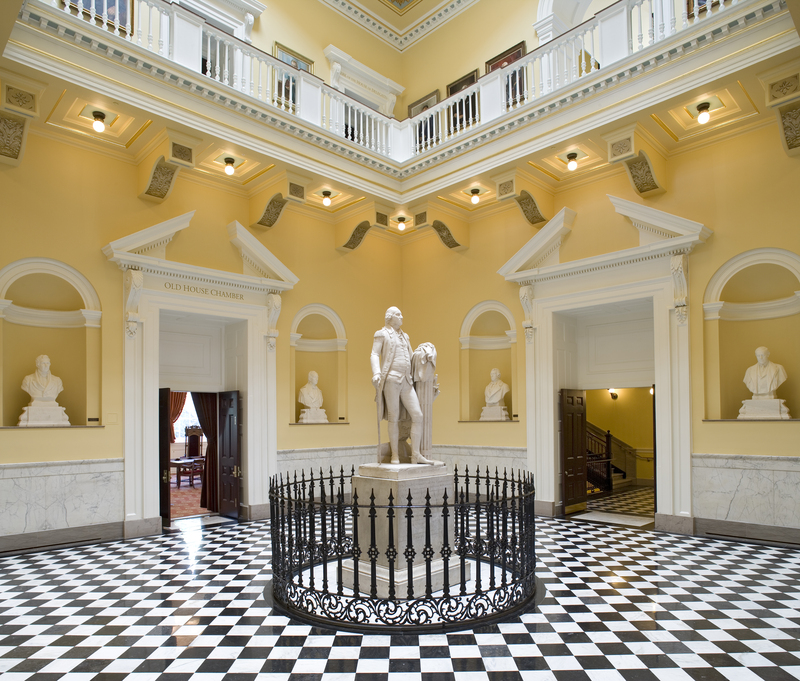 To learn more about the Rotunda and the Houdon statue visit http://virginiacapitol.gov/virtualtours/2nd_floor.html and click on Rotunda (1st image). A magnificent life-size marble statue of George Washington stands under an interior dome in the two-story Rotunda, located in the central portion of the Capitol. In June of 1784, the General Assembly commissioned this statue "of the finest marble and best workmanship" as a tribute to Virginia's most respected citizen-soldier. Governor Benjamin Harrison wrote to Thomas Jefferson, who was serving on a diplomatic mission in Paris, and asked him to engage a sculptor. Jefferson secured the services of Jean-Antoine Houdon, a skilled French artist. In the fall of 1785 Houdon visited Mount Vernon to study General Washington. He made a plaster mask of Washington's face, took detailed measurements of his body, and modeled a terra cotta bust. The statue was sculpted in France from fine Carrara marble and shipped to America early in 1796. Placed in the Rotunda on May 14th of that same year, the statue has been on nearly continuous display ever since. It was viewed by many of Washington's contemporaries, all of whom attested that it was a perfect likeness. Houdon's statue alludes to the similarities between Washington and the ancient Roman General Cincinnatus who, when Rome no longer needed him, gave up his military power and returned to the simple life of a farmer. The artist carefully balanced the military and civilian elements of Washington's career: his sword is by his side and he rests his left hand on a fasces (a bundle of rods, which was a Roman symbol of power), but he carries a civilian walking cane and stands next to a plow. Washington wears his Revolutionary uniform, but his head is uncovered and his facial expression is fatherly. Houdon's monument to America's foremost hero recalls Washington's life as a soldier, statesman, and virtuous private citizen. 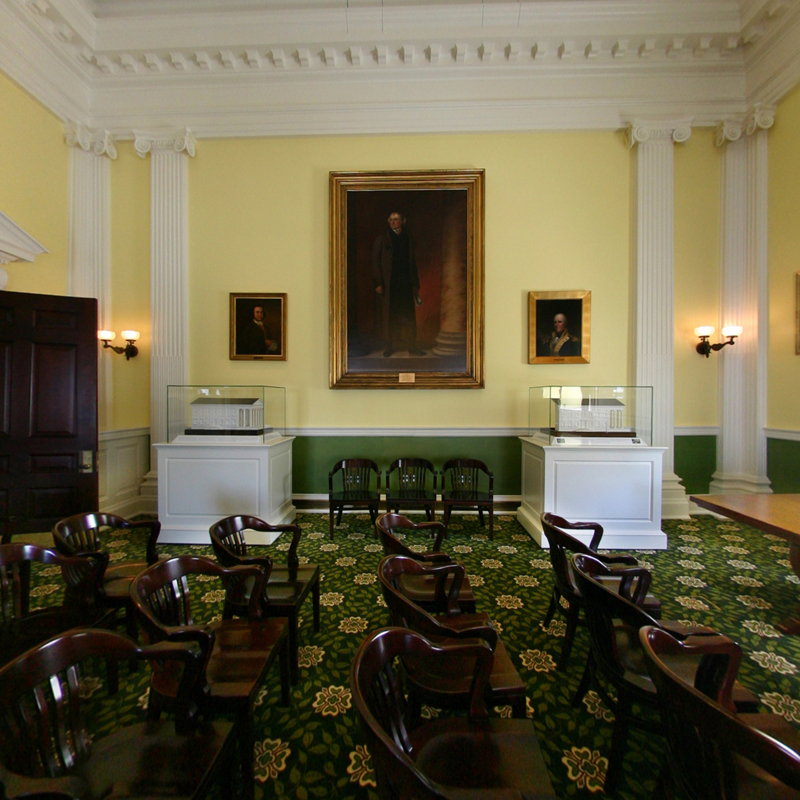 This room originally served for more than 50 years as the General Court Room for Virginia's judiciary. 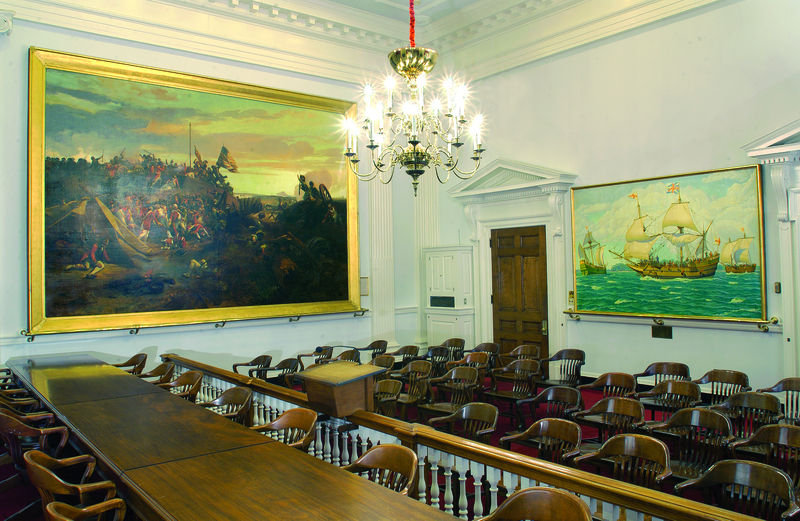 The Senate, which previously met in a smaller room on the third floor, moved into this room around 1840. In late 1861, the room was remodeled as the "Hall of Congress" for the Confederate House of Representatives. 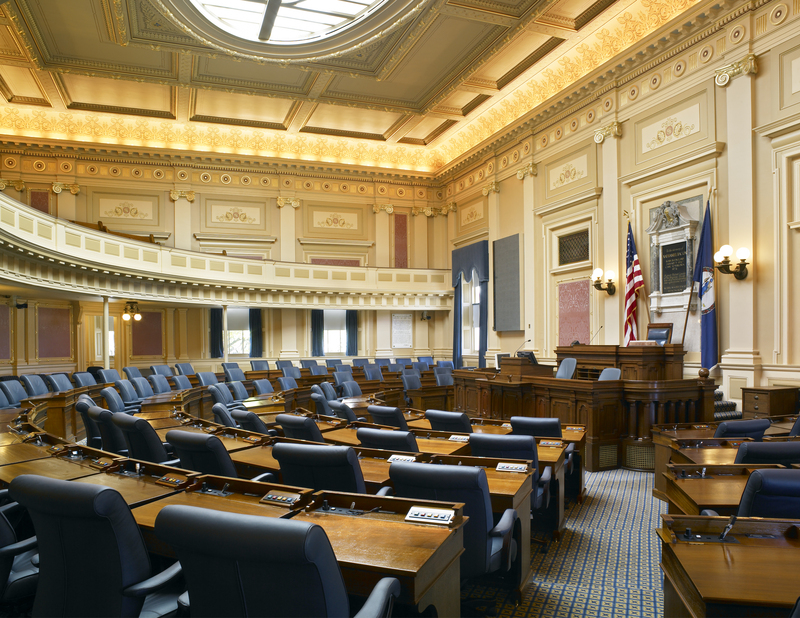 The Senate of Virginia returned here in 1865 from an upstairs room and held its last session in this room in 1904. To learn more about the paintings and historical objects in this room, including the painting by Griffith Baily Coale, showing three ships ascending the James River in 1607, which was authorized by the General Assembly with public funds to pay tribute to the 104 settlers who established the first successful English settlement in the New World visit http://virginiacapitol.gov/virtualtours/2nd_floor.html and click on the Old Senate Chamber (3rd image). The Old Hall of the House of Delegates (or Old House Chamber) is located off the Rotunda in the north end of the Capitol. At 76 feet in width, it has a dramatic coved ceiling, projecting cornices, and carved interior woodwork, which reflect the Capitol's Roman Classicism. Delegates assembled in rows of seats arranged around the Speaker's chair. As there was no other large meeting hall in the area, the room was also used for community events and church services in its early years, with Episcopal and Presbyterian congregations meeting on alternate Sundays. The Virginia House of Delegates met in the Old Hall regularly from 1788 until 1904. 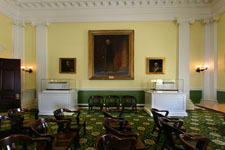 To learn more about the Old House Chamber and to see statuary and historical objects including the statue where General Robert E. Lee stood on April 23, 1861, when at the age of 54 he accepted command of the military forces of the Commonwealth of Virginia, visit http://virginiacapitol.gov/virtualtours/2nd_floor.html and click on the Old House Chamber (4th image). This room contains a large full-length portrait of Thomas Jefferson painted by George Catlin, who copied an original portrait by Thomas Sully now on display at West Point. Jefferson once wrote that "architecture is my delight." After the Revolution, Virginians instinctively turned to Jefferson and asked him to design a new state Capitol, combining "economy with elegance and utility." The plaster model on display, built by Jean-Pierre Fouquet, shows Jefferson's original architectural intent for the new Capitol of Virginia, which he designed in 1785-86. 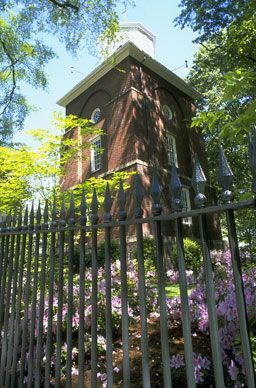 Jefferson designed this building to be "a temple of sovereignty." He hoped to impress foreign visitors, raise our reputation in the eyes of the world, and inspire citizens of Virginia. 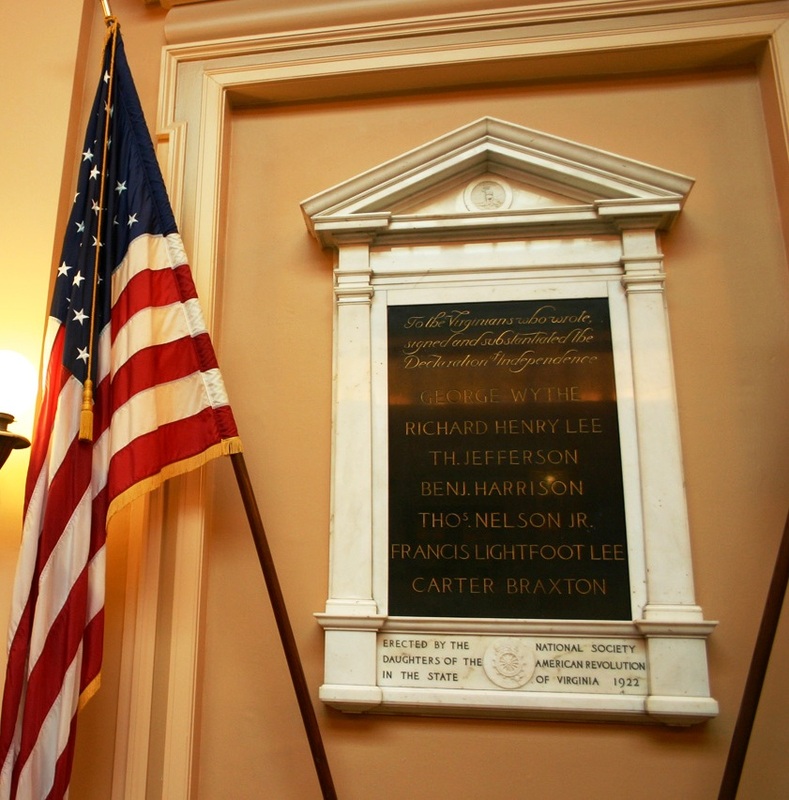 Jefferson was responsible for recommending the Shockoe hilltop location, choosing the Classical temple form, and arranging the interior floor plans to accommodate the legislative, executive, and judicial branches of Virginia's new "Commonwealth" government. To learn more about the paintings and historical objects including the plaster scale model for the Capitol, which Jefferson commissioned as being "absolutely necessary for the guide of workmen not very expert in their art. 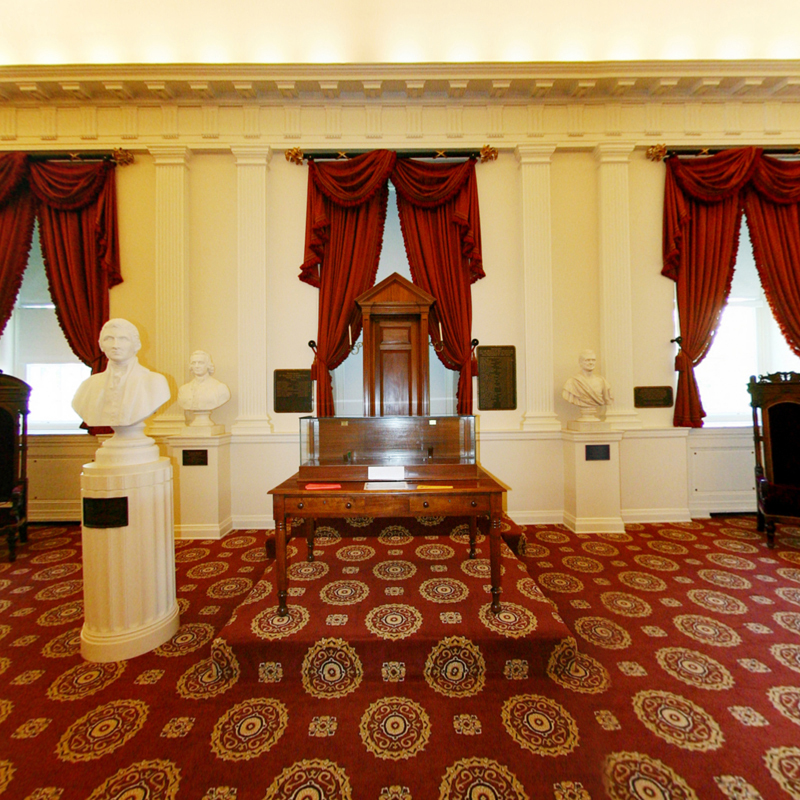 visit http://virginiacapitol.gov/virtualtours/2nd_floor.html and click on the Jefferson Room (2nd image). Between 1904 and 1906, architect John K. Peebles, a University of Virginia graduate, completed Jefferson's original architectural intent by adding front steps to the building. In addition, Peebles complimented the original Capitol with classical wings for each house of the Virginia General Assembly, flanking the original temple form structure. The Senate is composed of 40 Senators who are elected every four years. The Lieutenant Governor, a statewide elected official, is the President and presiding officer of the Senate. The President Pro Tempore and the Clerk of the Senate are elected by the membership, each for a four-year term. Portraits of former Lieutenant Governors who did not become Governor of Virginia are hung on the Chamber walls. Desks for the Senators fill the room, surrounding the Speaker's and Clerk's podiums. 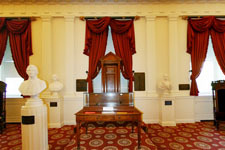 Over the podiums is the marble "Signers Tablet" commemorating the seven Virginians who signed the Declaration of Independence. The House of Delegates is composed of 100 Delegates who are elected every two years. The Speaker of the House is the presiding officer of the House of Delegates. The Speaker and the Clerk of the House are elected by the membership, each for a two-year term. Desks for the Delegates fill the room, surrounding the Speaker's and Clerk's podiums. On the wall behind the podiums is a bronze and marble tablet honoring Nathaniel Bacon. A marble bas-relief portrait of Lila Meade Valentine, a prominent educational reformer and suffragette, is displayed on the south wall. 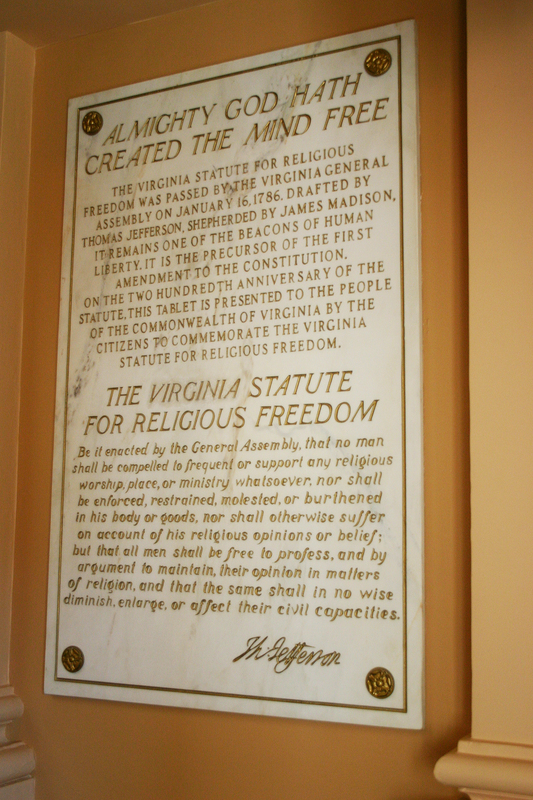 On the north wall is a marble tablet honoring the Virginia Statute for Religious Freedom written by Thomas Jefferson. The General Assembly convenes annually on the second Wednesday in January and are held in even-numbered years for 60 days and in odd-numbered years for 30 days. The 30-day Session is traditionally extended to 46 days. Winston Churchill, Margaret Thatcher (both honorary citizens of Virginia), and President Dwight D. Eisenhower have addressed Joint Sessions of the Virginia General Assembly in the House of Delegates Chamber. In May 2007, Her Majesty Queen Elizabeth II of Great Britain addressed the Virginia General Assembly in the House Chamber. 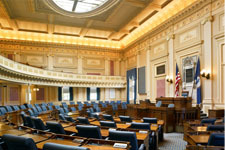 To learn more about each body of the General Assembly be sure to visit http://virginiacapitol.gov/virtualtours/2nd_floor.html and click on the Senate Chamber (6th image) and the House Chamber (5th image). From 2004 to 2007 the existing Capitol was restored to preserve exterior brick work and interior woodwork. Early 20th-century interior decorations were recreated in prominent public spaces. Useable square footage was enlarged by more than one-third by means of a new 27,000 square foot underground extension in front of the existing building. The expansion is largely "invisible architecture" in deference to the Classical symmetry of the existing building. The Capitol remains the working seat of Virginia's government, and it now has state-of-the-art facilities to welcome visitors to Thomas Jefferson's temple of democracy. To learn more about the 3 year renovation and expansion of the Capitol be sure to visit http://virginiacapitol.gov/virtualtours/extension.html and click on each of the images there to see the different sections of the Capitol Extension. 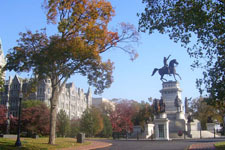 A large equestrian statue of George Washington atop a granite pedestal is located just northwest of the Capitol at the formal entrance to the square. This monument was conceived to honor Washington and to glorify Virginia's contributions to our nation's independence. Virginia's role in the Revolution is represented by bronze statues of six native sons, which surround the mounted figure of General Washington at the top of the granite monument. Smaller allegorical figures below the six standing statues are inscribed with themes reflecting each patriot's contribution: Andrew Lewis, Colonial Times; Patrick Henry, Revolution; George Mason, Bill of Rights; Thomas Jefferson, Independence; Thomas Nelson, Finance; and John Marshall, Justice. American sculptor Thomas Crawford designed the monument and completed the statues of Washington, Jefferson, and Henry. The cornerstone was laid on Washington's birthday, February 22, 1850, and the Washington statue was unveiled on February 22, 1858. Crawford died in 1857 before completing the monument. His American colleague, Randolph Rogers, executed the statues of Mason, Marshall, Nelson, and Lewis, as well as the allegorical figures, the last of which was put into place in 1869. 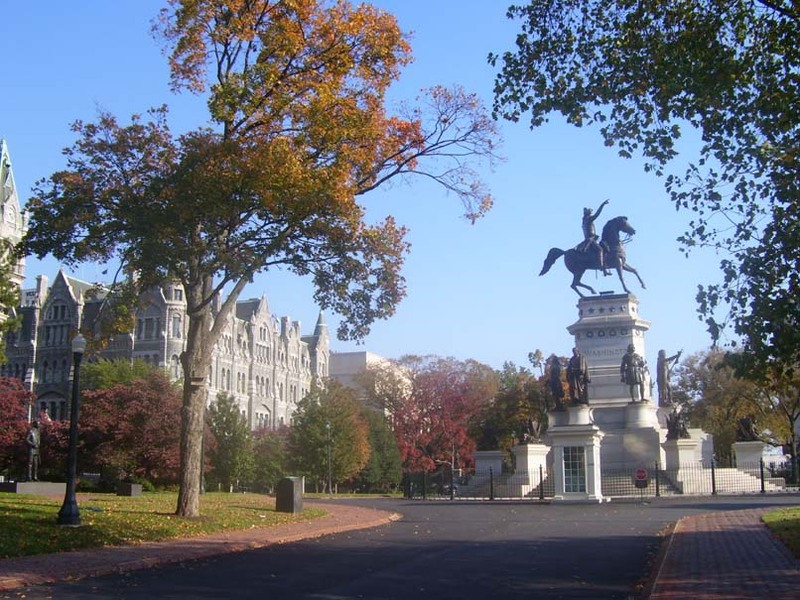 On the grounds north of the Capitol are bronze statues of former Virginia Governor and U.S. Senator Harry F. Byrd, Sr.; William "Extra Billy" Smith, Governor of Virginia and Confederate Brigadier General; Confederate Major General Thomas J. "Stonewall" Jackson; and Dr. Hunter Holmes McGuire, a respected Southern surgeon. In the southwest corner of the square near the Bell Tower is a seated statue of Edgar Allan Poe, who grew up in Richmond and returned years later to edit The Southern Literary Messenger. Among those honored with trees on the grounds are Presidents Washington and Tyler, Governors Colgate Darden, Charles Robb, and Gerald Baliles, and Nobel Peace Prize Laureate Martin Luther King, Jr. 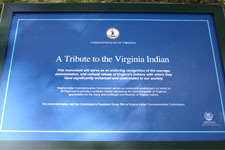 The newest monument on Capitol Square honors Virginians who were active in the Civil Rights Movement during the 1950s and 1960s and was dedicated on July 21, 2008. Along the lower western edge of Capitol Square is the brick Bell Tower. 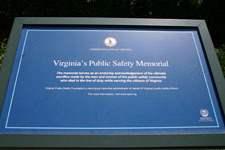 It was completed in 1825 for use by the Virginia Public Guard, a military predecessor to the present-day Virginia Capitol Police. The Virginia Tourism Corporation maintains a public visitor center on the tower's first floor.